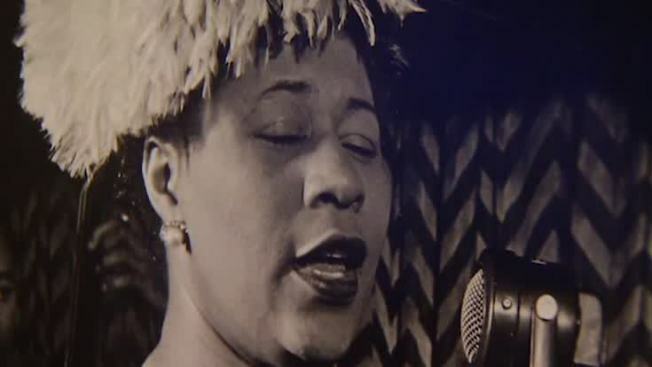 A 1947 photo of Ella Fitzgerald is on display at the National Portrait Gallery ahead of the 100 year anniversary of the jazz singer's birth. The portrait is on view beginning Thursday, ahead of the 100th anniversary of Fitzgerald's birth. Fitzgerald, who died in 1996 at the age of 79, would have celebrated her 100th birthday April 25. The National Portrait Gallery said in a statement the photograph on display is of Fitzgerald in performance flanked by Ray Brown, Dizzy Gillespie and Milt Jackson. It was taken around 1974 by William Gottlieb, who learned to use a camera to take pictures to accompany his weekly music column for The Washington Post. It's the first time the photograph has been displayed at the museum. It will be on view through May 14.